What a coincidence! 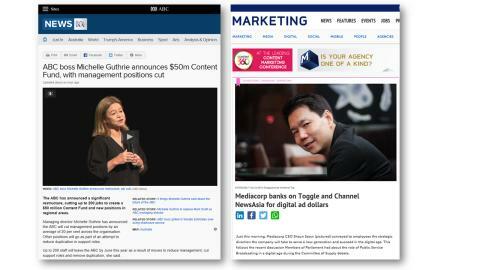 Two national broadcasters in the Asia Pacific announce on the same day that they are restructuring to focus more on digital content: Singapore's MediaCorp and the Australian Broadcasting Corporation said they want to increase digital output. I've linked to the articles below for all the details and discussion about the actual move. But my focus here is: what is the impact on you as an interview guest when the national broadcasters place as much emphasis on digital delivery channels as on traditional ones? More content... - MediaCorp CEO Shaun Seow talks about hiring more digital producers, and more co-creation with outside producers. The ABC talks about a A$50 million content fund, with more video to be produced in rural areas of Australia. Clearly, the differences in their footprint could not be more stark. But the impact is the same: unlike linear channels, digital delivery is not beholden to the number of broadcast hours in a day, or the amount of space in a newspaper. Digital means media organisations have a - literally - insatiable demand for content. That's no guarantee your news pitch will get a run. Digital reporters are already inundated. But the chances for good stories to get through are better when there are more hands on deck to receive them. ...that's more specialised... - if subject-matter experts-turned-media-producers get a shot at producing content for MediaCorp, you might soon find yourself interviewed by someone who knows your subject as well as you do. ...produced in new ways... Digital has forced a reinvention of content. What worked in traditional media needs to be adapted. If you are used to appearing in traditional media, get ready to learn new ways of appearing in new media. Digital doesn't have the budgets of traditional (the new content fund of A$50 mln pales compared to the ABC's billion-dollar annual budget) so don't expect the same production values as television. In the past you might have had a TV crew showing up at your office to record an interview. These days, it's just as likely to be a single person with a camera as small as a smart phone. Start by seeing yourself as part of the production team. Contribute where you can, such as by offering photos, videos, graphics and other inputs which help the digital producer tell your story. ...that's shorter still... - more doesn't necessarily mean longer. Even as the content promises to become deeper and richer, I don't see a big pick-up in lengthy documentaries. Your ability to deliver your message concisely will count more than ever. ...probably live... - going live has never been easier: you can already go live to a large audience through Facebook, YouTube and Instagram, and you don't need a big broadcast van with a microwave link facility to do it. Live programming, by definition, doesn't require any editing, saving digital producers more time. Are you ready for it? ...or where the deadline is now... and now... and now - Anyone who has dealt with the online-only media, such as trade publications or technology bloggers will know that the deadline is any time. MediaCorp wants to put its digital channels on an equal footing as television, such as by breaking news online just as readily as it does on its traditional channels. Be aware of this when you deliver your pitch. One final thought: you'll see some commentators say the national broadcasters are too slow in moving to digital. Perhaps that's true. But are media participants ready for it, too?